Guided historical walks of Sheffield accompanied by humorous anecdotes, local folklore & the opportunity to view Sheffield's finest architecture. Ron Claytons's tours are as entertaining as they are informative. Ron Clayton is a full time professional Sheffielder! 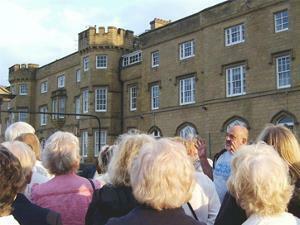 He regularly gives walking history tours of Sheffield and can also be hired to give public speeches. These focus on a wide range of Sheffield history related topics; from “Sheffield’s Military History” to “The Great Flood” to “Some Famous Sheffield Ghosts and Hauntings” and lots more. So if you’d like to hear more about the stiff upper lip of ‘Blitz-Time Sheffield’, or you’re fascinated by the mysterious and supernatural tale of ‘Spring Heeled Jack.’ Get in touch to join Ron on one of his History Tours or have him speak at your next event. Ron is not just a BA Hons in History from Sheffield University (which he has) but an entertainer, a wit raconteur and an engaging speaker. All walks last two hours and usually finish in the Old Queens Head Pub or a pub/coffee shop of your choice. To arrange a tour please contact Ron Clayton.